Lana Del Rey seems to exist outside of time as her style reminds us of decades past with her classy 60s inspired dresses, glamourous hairstyles and her 80s evocative biker girl looks. From glamour to grunge, Lana’s unique style has recreated the vintage times of the 40s all through to the retro 80s and ends with her casual jeans, tee and baseball cap look. Her hair has also echoed the times: beautiful beehives, long 40s waves and a straight middle-parted 70s style. 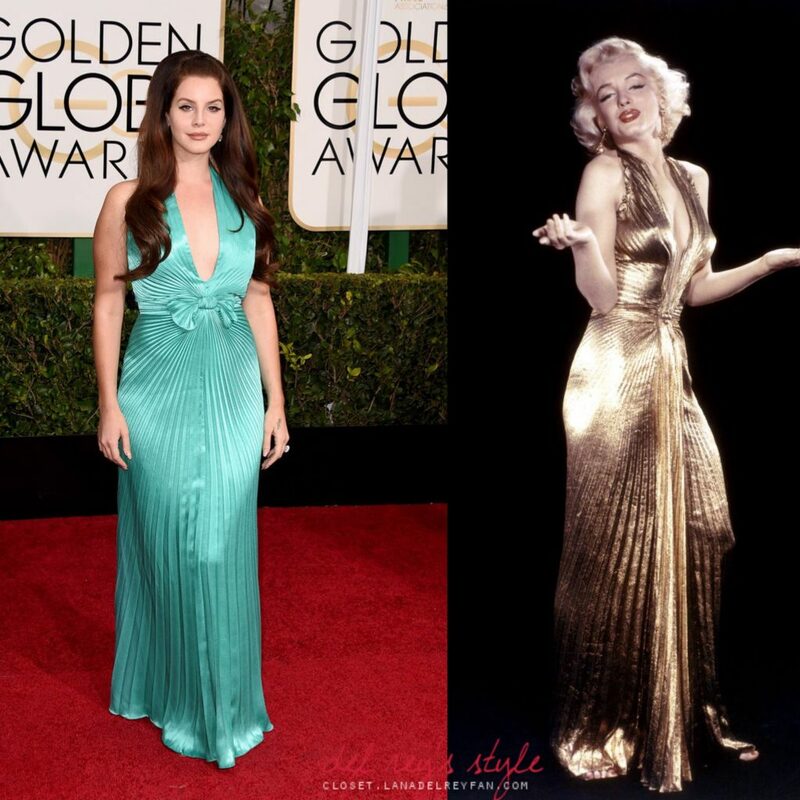 When trying to replicate or borrow from Lana’s style, think The God Father, American Beauty and Mad Men! Think Priscilla Presley, Marilyn Monroe and Debbie Harry! Lana’s personality is also a very big part of her appearance. Her demure of young actresses from Old Hollywood only accenuate her big beauty queen hairstyle, vintage dreses, red lipsticks and faux fur coats even further. Lana has become well known for certain fashion items which have resonated well with her image and her fans. Obtaining and doing any of these will help you to emulate Lana’s look very easily! Lana is spotted frequently in various baseballs caps. Get Lana’s signature New York Yankees baseball cap here. Lana inspired the creation of Jack Daniel’s t-shirts with her name on them. Head over to Amazon US and Archetype to get your own. Alternatively, you can buy the original Jack Daniel’s t-shirts on their official website. Lana has a beloved collection of F1 Racing jackets, particuarly favouring the red Ferrari one. Search for the Ferrari Jackets on ebay. Lana has become known for wearing a flower crown whilst performing live on her tours. However, one of Lana’s first appearances donning a flower crown was in the Born to Die music video. You can buy flower crowns from most high street stores such as New Look, TopShop and boohoo. Don’t forget to also check eBay and Etsy. Alternatively, learn how to make your own Lana inspired flower crown here. Lana is frequently seen wearing long acrylic false nails, which you can get done at a nail salon. Lana has many signature hairstyles, most of which seem to be emulating Old Hollywood Glamour. There is an endless amount of tutorials for how to get some of Lana’s key hairstyles. Her most admired are the beehive/bouffant and side swept waves/curls.